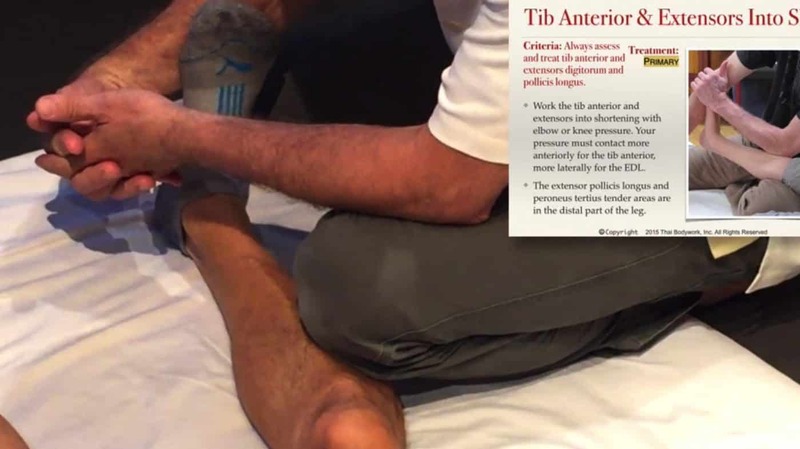 CTB for Foot, Ankle and Lower Leg Pain: Foot and lower leg pain can be debilitating and severe, and cause other problems up the kinetic chain due to disturbed gait. This area is also one in which Clinical Thai Bodywork techniques can have some of the most profound benefits. You will learn to address pain following breaks and sprains, plantar fasciitis, calf pain and tenderness, rigid ankles, big toe pain (which can be misdiagnosed as gout) and chronic conditions such as hyperpronation and hammer toe. CTB for Shoulder, Upper Back and Upper Arm Pain: Learn to resolve a high percentage of shoulder pain cases using the state of the art techniques of Clinical Thai Bodywork (CTB), a revolutionary modality developed by your expert instructor, Chuck Duff. Clients often struggle for years with diagnoses such as frozen shoulder, torn rotator cuff and many others, and are offered no effective treatment options. Learn to transform lives by eliminating shoulder pain, often with dramatic results in a few sessions. Getting to the heart of hip, thigh and knee pain requires understanding not only basic trigger point referral information, but how muscles collaborate in extensive networks of satellite referral and kinetic chain dysfunction. CTB for Hip, Thigh, Knee and Groin Pain will show you how to truly resolve these conditions by treating the 25 muscles that contribute pain in this area. You'll be shocked at how this information will transform your practice. Clients presenting with forearm and hand pain, numbness, weakness, loss of coordination, tingling, limited ROM and other symptoms are often excellent candidates for Clinical Thai Bodywork. These symptoms are often caused by trigger points, and the therapist must learn to follow symptoms cascading from long upstream referral chains from muscles in the back and shoulder. Hand and forearm pain is one of the most difficult areas to understand, due to the large number and complex arrangement of the 32+ muscles in this area. CTB for Hand, Forearm and Elbow Pain teaches you how to analyze and treat these muscles in a consistent, understandable way. CTBI offers a unique opportunity to earn advanced certification in an extremely powerful clinical bodywork modality for relief of pain and dysfunction. CTB Advanced and Master level certifications (CTB-2 and CTB-3) build on the foundation of our our Coaching The Body Practitioner (CTBP or CTB-1) Certification. CTB was initially developed by Chuck Duff in 2005, and refined over the years into the robust program that it is today, covering the full body in 7 body areas. CTB integrates powerful Thai techniques with an updated and thorough understanding of Travell & Simons trigger point therapy, as well as aspects of osteopathy and asian medicine. CTB can often address serious pain conditions that have failed other treatment approaches. While the certifications themselves are earned consecutively, we permit and encourage advanced coursework for CTBP students while in the process of completing their basic coursework. We have found that when students take advanced classes early, it informs all of their training and establishes competency more quickly. We will approve attendance at these classes on an individual basis depending on knowledge and previous experience. CTB advanced certification consists of both coursework and practical, hands-on session work developing competency in each of 7 body areas. The Advanced level includes 4 body areas: Hip/Thigh, Shoulder, Low Back and Mid-Back/Abdominal. The Master level adds Forearm/Hand, Head/Neck and Foot/Ankle. Since this is a competency-based certification, students may complete the process more or less quickly depending on their ability to practice and pursue self-study. There are online components to all coursework, providing the opportunity to study theory before and after attending in person. This is an ideal combination and allows us to focus more on practical interaction during class. Master Level Certification (CTB-3) is the highest level that we award. In addition to mastering all 7 body areas, students must complete case studies and have significant interaction with the senior instructors to verify their knowledge. CTB Body Area Coursework: Attending the CTB course relevant to a given pain area is a prerequisite for the other steps. We highly recommend that students take these classes as they occur, since each of the body areas is only presented on an as-needed basis. Body area classes are taught in a highly interactive small group format. Small Group Clinical Mentoring Classes: Treatment Design for Upper Body and Lower Body are offered as small group workshops for Advanced and Master Level CTB apprentices. These classes explore the higher level of understanding and designing therapeutic treatments that is expected of our advanced apprentices. They are highly interactive, and students may check out in specific muscles during these sessions. Body Area Certification and Testing: Students are given a spreadsheet of muscles for each pain area and can have each area of muscle knowledge approved by the instructor as a step toward specific certification for the pain area. Testable muscle knowledge includes muscle anatomy, function, trigger point referral patterns, likely tender spot locations, assessment, preferred treatment techniques, and more. A portion of muscle knowledge checkout can be done via remote video mentoring. Hands-on knowledge must be assessed in class or in private mentoring sessions. Visit our tuition page for financial information on paying for coursework.